Chisum Gold Filtered Cigars are available in Box 100's and packaged 20 cigars per pack, 10 packs to a carton for a total of 200 premium filtered cigars. Generally speaking, a good cigar is expensive and takes a pretty long time to enjoy. Years ago smokers have been asking "is there a way to deliver all the flavor cigar smokers expect but at a fraction of the cost”. 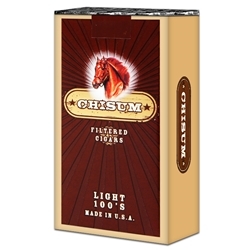 Today, cigar smokers are excited to say Chisum filtered cigars have hit it out of the park, and smokers everywhere are enjoying an easy, inexpensive way to enjoy a unique smoke experience when they feel like it. They used to be called Lights and now are called GOLD!! !